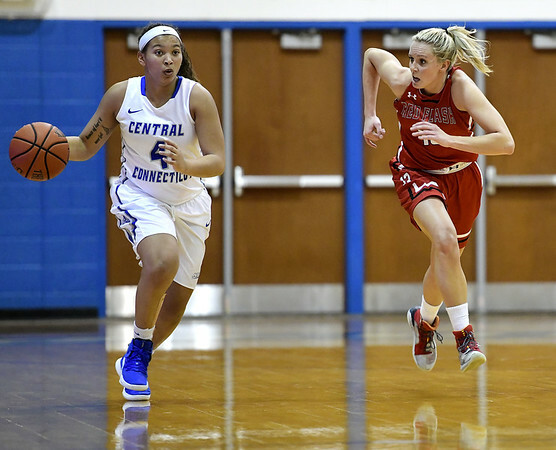 NEW BRITAIN - It’s no surprise CCSU women’s basketball head coach Beryl Piper stressed the importance of finding consistent scoring Monday afternoon. The Blue Devils shot just 39 percent from the field in their 64-57 loss to Robert Morris adding onto a tough stretch that has seen the team drop seven of its past eight. But while Piper is still searching for more scoring options, at least the head coach can rely on senior Kiana Patterson. Patterson led the Blue Devils (4-12, 1-5 NEC) with 15 points on Monday while shooting 43 percent from beyond the arc, in what both Piper and Patterson considered to be a frustrating day. Of course, after Patterson dropped 27 points in Saturday’s win against Saint Francis, it’s harder to see Monday’s game as the solid individual performance that it was. On top of Patterson’s 15 points, she also contributed four assists in an effort to get the offensive engine revving. With the consistent production of Patterson, who ranks fifth in the NEC in scoring, Piper has been forced to lean on her senior while the rest of the Blue Devils find their way offensively. At times, like late in Monday’s loss, Piper can see the physical toll of the minutes Patterson has played at times this season. Patterson logged 36 minutes on Monday after playing 34 in Saturday’s 27-point outburst. She has played under 30 minutes just twice so far this season (29 and 28), all adding up to 32.5 minutes per game, good for seventh in the conference. If the heavy work load is taking a toll, Patterson isn’t showing it, at least not in the scoring column. Over her past 11 games, Patterson is averaging 17 points, as she continues to settle into a shooting groove. Patterson has rewarded her post players by showing exceptional court vision of late, recording nine assists over the past two games while turning it over just three times. Patterson plans on keeping the Blue Devils going through conference play, and toward the team’s ultimate goal come March. As NEC play hits its stride, Patterson plans on doing the same. So far, she’s right on schedule. Posted in Newington Town Crier, CCSU on Tuesday, 22 January 2019 21:20. Updated: Tuesday, 22 January 2019 21:23.